This entry was posted in benchmarking, building energy, EIA, energy efficiency, green buildings and tagged EIA by The Pragmatic Steward. Bookmark the permalink. 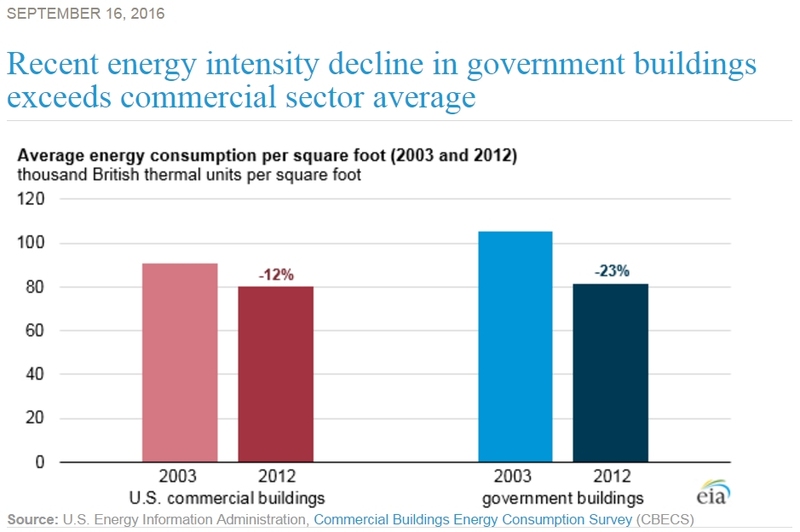 This is also an example of an issue that has been around and repeated for at least forty years (and will still be with us in 2057 if this EIA post is any indication), namely that energy-fat buildings/processes/companies can more easily lose X percent of their energy use than energy-fit ones. When are we going to see an end to bragging about losing fat and a beginning to apologizing for being energy-overweight? Another point: the EIA data is from 2012. In today’s urgent situation relevant data needs to be updated much quicker. Many companies and governments have set carbon reduction targets for 2020. Are we not going to know whether they met their targets until 2025? I’m glad I wasn’t drinking anything when I read your title, I would have spit it out all over my screen! By the way, Green Button can be used with monthly data, implementation costs are estimated at $3-4/meter, a one time cost. With that, you can monitor savings in near real-time.